Baffles are available with two (Heradesign Baffle basic) or three layer (Heradesign Baffle aluDesign) acoustic units with wood wool acoustic cover layers on both sides. The three layer baffle has an additional mineral wool core, and this combination of wood wool and mineral wool yields outstanding absorption values in a wide frequency range. Due to their special shape, baffles create unique design options and are suitable for a variety of applications including schools or public buildings. Heradesign is available with fine and superfine surfaces and in sizes: 1200 x 300 or 600 x 300 mm (57 mm thickness). Supplied with a galvanized metal frame and are also available in reaction to fire class: A2-s1,d0 (non-combustible). Baffles with a fleece-coated, classic, white surface. The product is especially suited to applications where high value is placed on a plain, discreet visual appearance with optimal room acoustics. Offers a large range of design options. The front faced acoustic fleece is available in different colours and can be combined in any way giving every room a unique, distinctive design and fulfilling the highest room acoustic requirements. The highly absorbent baffle system does not just provide excellent room acoustics, but also offers an almost infinite number of possibilities for lively and modern interior design. The fleece-coated surface decor can be printed to project requirements offering a high degree of individuality and design freedom. Extension of the active acoustic surface in a room. Retrospective acoustic optimization of rooms. Fixed by cable suspension, industry system or grid system (not supplied). Available in two sizes, with other special sizes available on request. To EN ISO 354, consult manufacturer's literature for details. 1200 x 300 mm: 3 kg. 1200 x 600 mm: 6.2 kg. The product information below is from the NBS Plus library of product clauses offered in NBS specification products. 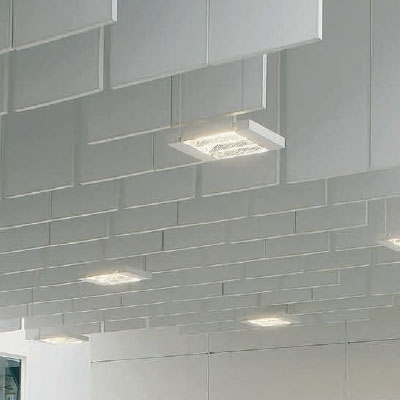 It has been created by NBS for Knauf AMF Ceilings Ltd. Each product clause is authored in NBS format and is intended for inclusion in project specifications. Please note that NBS product guidance is not a replacement for the manufacturer's literature and it is recommended that Knauf AMF Ceilings Ltd be consulted before specifying. Thermatex Classic, Colour and Exclusive. Bespoke printed motifs available, insert requirements. Thermatex Exclusive.